Who says you can’t feel summer in the midst of a cold weather? Thanks to our guest author, Manilyn with Better Cater for sharing this simple, healthy and oh-so-summery treat with us! A bowl of healthy, fresh, and lusciously-yummy vegetarian salad will do so much to supply the body with all the nutrients you need to stay slim, fit and healthy at the same time. Even the simplest homegrown ingredients raised in your backyard can offer you a rich dose of nutrients that’ll surely do so much to keep your body at its best. Tomatoes are all time favorite and, surely, any cuisine is never complete unless there are slices of them to add health and flavor to it. I’ve always loved to cook something nice even with just a bunch of tomatoes aside. I can put them on top of pizzas and spoil it with lots of cheese, or make a bowl of fresh and warm tomato sauce. But of course, nothing beats tomatoes when they’re tossed over for a plate or two of tomato salad. I use heirloom green or yellow tomatoes, which taste so nice, or I can also make something special with a bunch of reds. I once made a salad with kiwi fruit, I also tried pairing tomatoes with avocados, or green beans, and the result was a feast that my family and friends can’t help but love. Right now, I’m going to share with you another nice tomato salad recipe. It’s a tomato salad mixed with red kraut. I tried this for the pot luck dinner at a friend’s house a few weeks ago and it was a huge hit! I brought two bowls of it and both were tidied up by the time I went home. 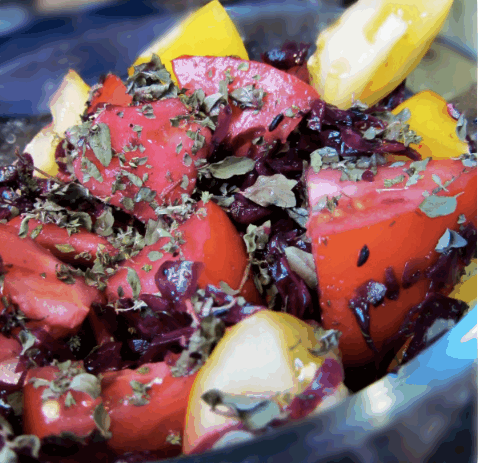 Tomato salad with red kraut is refreshing, tummy-filling and very easy-to-do. In fact, it won’t take more than 30 minutes to prepare! Grab a piece or two of fresh tomato, chop and mix with 1 clove fresh garlic, minced ¼ cup of red sauerkraut, a teaspoon or two of apple cider vinegar, olive oil, oregano and oregano. Store in the fridge and serve with sliced avocado; this is perfect to munch on warm afternoons or to pair with cool outdoor dinners. sea salt, pepper and seasoning to taste. Chop tomatoes into cubes or bite sizes and toss all the ingredients together. Mix red kraut and mix gently. Keep inside the fridge and wait until cold to serve. What’s nice with recipe is you can serve this any time of the year, whether you’re having this for a snack one a lazy night ( when you don’t want to do anything but watch movies) or bring this over for a picnic with friends. This recipe will always suit everyone’s palate because it’s light and refreshing, so you’ll find it a delight to match your cravings. You can have you own diet-friendly meals prepared fresh and hot and fitting that’ll imbue the warmth of summer this season! About the Author – This article is contributed by Manilyn Moreno, on behalf of Better Cater, a company providing catering software that is easy to learn and use. 1 Pings/Trackbacks for "Summer-Themed Gluten & Dairy Free Recipe for a Cold, Wintry Day"